A series of deals looks set to turn handsets into mobile wallets in many developing nations. South African mobile operator MTN is launching a banking service for its customers in 21 nations that will let them transfer cash. It comes after four other initiatives were announced to help handsets carry out many basic financial transactions. One initiative is backed by Bill Gates and puts $12.5m (£8.6m) into a plan to create a mobile banking service. "It goes back to a simple gap - the difference between mobie penetration and banking penetration," said Dare Okoudjou, head of MTN's mobile money development. "What the gap says is that a lot of people do not have formal access to financial services, whereas they do have a mobile telephone or are living with someone who does have access to a mobile handset," he said. 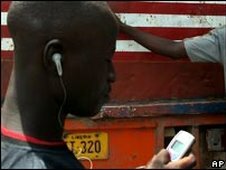 In some nations such as Benin, said Mr Okoudjou, about 18% of people had a mobile but only 1% had a bank account. MTN has signed up with South African mobile payments firm Fundamo to set up the mobile banking service. Mr Okoudjou said it would allow people to move real money between the mobile accounts associated with handsets. By contrast, he said, many other mobile initiatives only allow customers to move airtime as a form of pseudo-currency. Those signing up to the MTN banking service will have an account created for them through which they can send and receive money to other account holders. The basic set-up was free, said Mr Okoudjou, but MTN would levy a small charge on transactions. Prior to MTN's announcement, many others have revealed plans to turn handsets into mobile wallets. In early March 2009, Mi-Pay and Isys unveiled a scheme in Sudan that would act as a test-bed for a person-to-person banking scheme that they eventually hope to take to 22 nations in Africa and the Middle East. In February 2009, Monitise struck a deal with E-Fulusi Africa to set up mobile banking systems in East Africa. Earlier that month, Standard Chartered and Citibank revealed a mobile banking service called Zap that they hope to take to more than 100m Africans. The Bill and Melinda Gates Foundation have also announced that it was putting $12.5m (£8.6m) into a mobile phone industry-backed program to help poorer people get at banking services. All the initiatives build on the huge success of mobile banking in African nations, such as the M-Pesa system Kenya which has put operators in competition with the nation's banks.